After my rose bush continually falling over, I bought a large square pot and planted it in, and placed 24 winter pansies round the edge, and I think it loos really nice now. 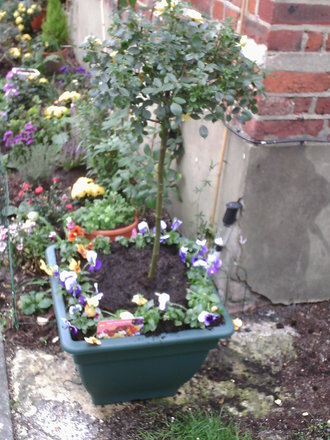 Very nice alex, just planted some pansies myself always think they are cheerful little flowers. I agree with you Sewingkilla, they look so cheerful. i have replanted my window boxes with winter pansies today. Have cleared the pots at the front of house ready to plant up with more pansies tomorrow. pansies probably the hardiest,almost ready for my pansies to go out.its a good idea to add to pots like yours alex to brighten up the dull winter. Are gardeners wrong to put 'crocks' in plant pots?